Styling ‘Chelsea Boots’ is now easy! There are some popular boots whom men simply adore but somehow many fail to style them properly. Although it’s easy for you to think but when it comes to dressing, we terrible fail. Don't worry you can read our guide to know more about wearing them. Select your favorite look! The Rocker Look: If you are bored of the same routine of dressing then this rocker look will be a refreshing one. Team your leather jacket with black skinny jeans and a white tee and of course Chelsea Boots for a finished look. If you want to accessorize; go for some leather bracelets. Don't overburden please. The Businessman Look: What to wear when you are on such a high profile becomes a massive war in the morning. Obviously you have to look smart, classy and sophisticated. Embrace your look with a smart suit, tie (not mandatory) with a crisp white shirt, just to maintain a simple look. To glance a little bit; style a watch. If it's all about winters then prefer keeping an overcoat just to keep yourself warm. The Everyday Look: Simply the common look! 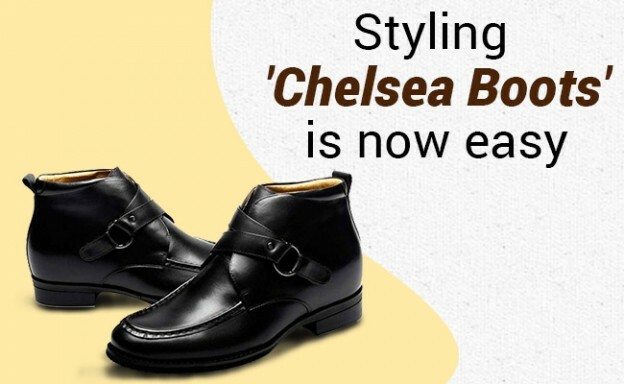 Chelsea boots will be the best thought if you are going for your casual day out. Try a trench coat or an overcoat, a denim shirt, chinos or slim cut jeans, and finish your look with Chelsea boots preferably brown color. This combination is perfect for your evenings or days. So, Gentleman! Embrace your overall look with Chelsea boots and make a style statement.